I have been a water rat all my life. A competitive swimmer, surfer and sailboat racer during the high school years in Florida. Four years in the Navy as a diver and ordinance technician took me all took me all over the Pacific and gave me my first taste of Hawaii. Surfing in Hawaii was very different than those Florida waves. While in the navy, I picked up skiing. I have forty years under my belt now and have been fortunate enough to go helicopter skiing a few times. What an experience. I started windsurfing in 1986 while living in Utah. I gave up dirtbiking in favor of windsurfing, because there weren’t very many women dirtbikers. I moved to Washington 2 years later and met my wife windsurfing at the Gorge. We made the trek from Seattle to Hood River almost every weekend during the summer for 16 years with trips to Maui preceding and following the summer season at the Gorge. We bought a 46′ sailboat in 2002 and lived aboard for 10 years before semi-retiring and sailing off to Mexico and the south pacific for 3 ½ years. Besides meeting and marrying my wife, it was one of the best experiences of my life. It was during that voyage, while we were in Fiji, that we had our first taste of kiting. The kiters were out having a good time so we gave it a go. That was seven years ago. Since then, we bought a home here in Maui where all of our windsurfing gear is gathering dust under our house. 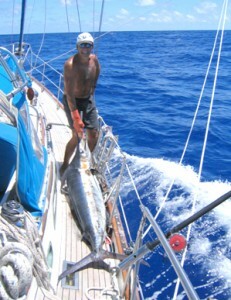 Here in Maui, I have worked as a boat mechanic and a boat captain. I have been teaching Kiting for about 2 years now. I love teaching and sharing this sport, It is so gratifying taking someone from zero to hero. My passion is riding the waves. I am so sad at the end of wave season and so excited when it returns in the fall. Justin V.: One on one is great! Body drag in tandem was good to have the instructor there to comment.